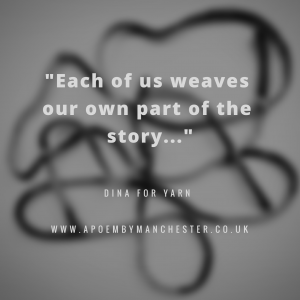 Yarn is a poem collectively created online by residents of Manchester and curated by local community artist Kirsty Gbasai. Between May and August 2018. Manchester residents were invited on social media to take part by submitting a sentence inspired by a previous sentence displayed on the website. The entire aim was to bring together the people of Manchester, united in writing a poem to document the creativity of the cities’ residents, whilst generating a unique piece of writing – and it has done just that! By the submission deadline of 31st Aug 2018, 218 people had taken part, with 245 unique sentences submitted. Since then, the poem has been edited and shared with its Manchester resident ‘Yarn Writers’ who are now coming together as a group to take the project further and create a public facing reveal in 2019 for Manchester, the city we call home.